Eastern Star Gas Limited is engaged in the exploration for oil and gas, development and production of natural gas, and production of electricity from a gas fired power station. The Company's principal activity, the Narrabri Coal Seam Gas Project, is located in Petroleum Exploration Licence 238 adjacent to the township of Narrabri in the state of New South Wales Australia. The Company holds a 65% interest in the PEL 238 and is the Operator. The remaining 35% interest is held by Santos Limited. PEL 238 covers 7,920 square kilometers (1.96 million acres) of the Gunnedah Basin. During the year ended June 30, 2011, the Company completed seven exploration coreholes to test the coal seam gas potential of the Late Permian Black Jack and Early Permian Maules Creek formation coals. In November 2011, Santos Limited acquired Eastern Star Gas Limited. Sign-up to receive the latest news and ratings for ESG and its competitors with MarketBeat's FREE daily newsletter. What is FlexShares STOXX US ESG Impact Index Fund's stock symbol? 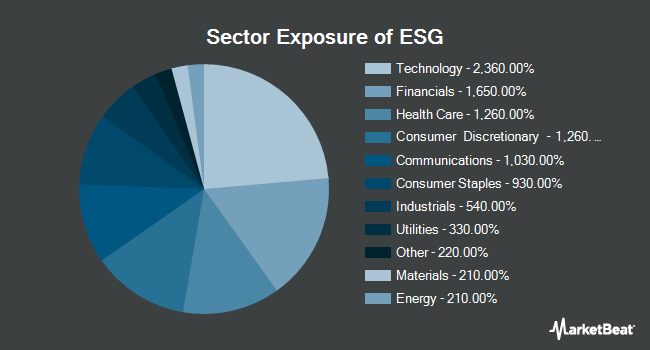 FlexShares STOXX US ESG Impact Index Fund trades on the NASDAQ under the ticker symbol "ESG." How often does FlexShares STOXX US ESG Impact Index Fund pay dividends? What is the dividend yield for FlexShares STOXX US ESG Impact Index Fund? FlexShares STOXX US ESG Impact Index Fund announced a quarterly dividend on Friday, March 15th. Stockholders of record on Monday, March 18th will be given a dividend of $0.2513 per share on Thursday, March 21st. This represents a $1.01 annualized dividend and a dividend yield of 1.44%. The ex-dividend date is Friday, March 15th. View FlexShares STOXX US ESG Impact Index Fund's Dividend History. Has FlexShares STOXX US ESG Impact Index Fund been receiving favorable news coverage? Media stories about ESG stock have been trending negative on Friday, according to InfoTrie Sentiment Analysis. InfoTrie identifies positive and negative press coverage by reviewing more than six thousand blog and news sources. The firm ranks coverage of publicly-traded companies on a scale of negative five to positive five, with scores closest to five being the most favorable. FlexShares STOXX US ESG Impact Index Fund earned a news sentiment score of -2.2 on InfoTrie's scale. They also assigned news coverage about the company a news buzz of 10.0 out of 10, meaning that recent press coverage is extremely likely to have an effect on the stock's share price in the next few days. What other stocks do shareholders of FlexShares STOXX US ESG Impact Index Fund own? Based on aggregate information from My MarketBeat watchlists, some companies that other FlexShares STOXX US ESG Impact Index Fund investors own include Santos (STO), PepsiCo (PEP), Naked Brand Group (NAKD), Level One Bancorp (LEVL), Innophos (IPHS), i3 Verticals (IIIV), Chart Industries (GTLS), Educational Development (EDUC), ANSYS (ANSS) and Secure Trust Bank (STB). How do I buy shares of FlexShares STOXX US ESG Impact Index Fund? Shares of ESG can be purchased through any online brokerage account. Popular online brokerages with access to the U.S. stock market include Vanguard Brokerage Services, TD Ameritrade, E*TRADE, Scottrade, Fidelity and Charles Schwab. What is FlexShares STOXX US ESG Impact Index Fund's stock price today? One share of ESG stock can currently be purchased for approximately $69.6340. How big of a company is FlexShares STOXX US ESG Impact Index Fund? FlexShares STOXX US ESG Impact Index Fund has a market capitalization of $43.52 million. MarketBeat's community ratings are surveys of what our community members think about FlexShares STOXX US ESG Impact Index Fund and other stocks. Vote "Outperform" if you believe ESG will outperform the S&P 500 over the long term. Vote "Underperform" if you believe ESG will underperform the S&P 500 over the long term. You may vote once every thirty days.